In the middle of some humdrum daily activity, I’ll shove my hands into my coat pockets and be met with an unmistakably gritty sensation. I can’t complain; it’s my own fault. The bits of sand that infiltrate all pocket-based items are the result of a dastardly addiction. 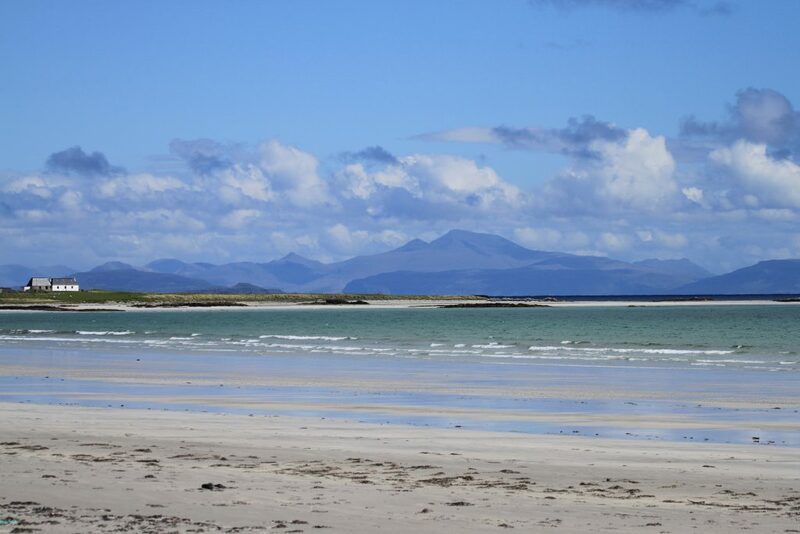 Tiree was made for beachcombing. With eyes like a magpie, I like to lose myself in the zen state of shell collecting. Different beaches are good for different types of shell. If I’m in the mood for acquisition, I plan my day around which types I would most like to find. 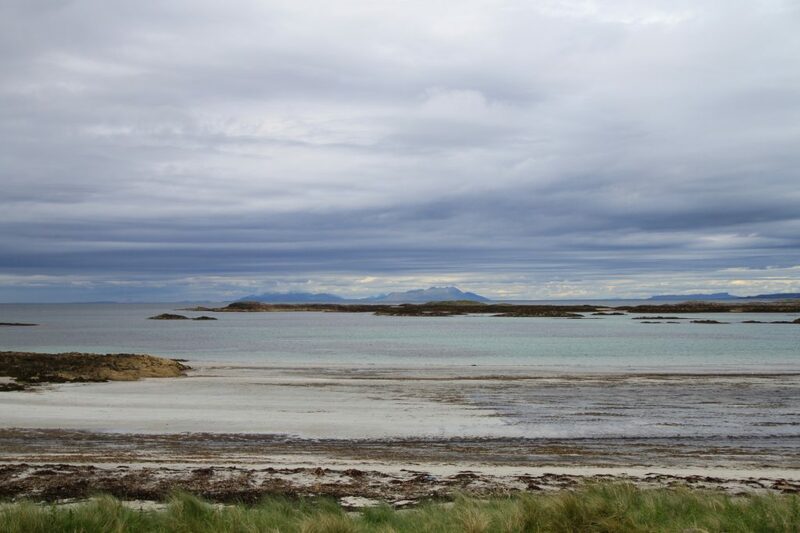 Vaul Bay, east of the Ringing Stone: The starting point for many happy shell and pebble collecting expeditions. Near to the Ringing Stone, drifts of Flat Periwinkles accumulate. They are tiny and they are lovely; ranging from dark plum, to rich caramel, to the vivid gold of a freshly broken egg. Running your fingers through these drifts is like scooping up handfuls of treasure. Sometimes, nature knows how to make you feel like a millionaire (even if the reality is woefully different). Mixed among the periwinkles is an even more delicious jewel – Cowry shells, the exact size and colour of soaked pearl barley. They have the slightly translucent quality of a bone china teacup; feeling just as cool and fine to the touch. Along Gott Bay, fragments of white coral and halves of Banded Venus grace the strandline. These last are pinkish cream, with handsome brown stripes that run from the hinge to the ventral margin. The two ‘ends’ of Gott Bay seem to be better for shells; but be mindful of wader roosts during the winter. The names of seashells are as charming as their form – how about a Faroe Sunset? A Painted Topshell? Or a Pelican’s Foot? You can find them here, and they will delight you. Regrettably, Sea Potatoes got the short end of the stick when names were given out. You couldn’t accuse them of being glamorous, and the name doesn’t help their cause. In life, Sea Potatoes are unfortunate looking beige blobs with a thatch of unremarkable, beige spines. The bleached ‘tests’ of these urchin-like creatures are common. It’s a bit sad, finding their chipped and broken leftovers next to the Faroe Sunsets; they must feel terribly inadequate. I have a covetous nature when it comes to seashells. Like addicts everywhere, the burden of guilt lies heavy on my soul. As a conservationist, I know that collecting too many shells is naughty. These structures fulfil several important roles in our environment. This knowledge-guilt has spawned a strange and undeniably obsessive shell collecting regime. Only the most perfect shells are selected. Those whose splendor is incomplete are refused entry to The Shell Jar. Further, I work with a diligent system of upgrading my shells. More striking specimens replace old models – which are dutifully carried back onto the shore, to reach their final Nirvana of being blown as tiny fragments out onto our Machair. I use tweezers to arrange my finds; ensuring that everyone’s most attractive side is outward. My mother, on seeing this display, invariably lifts it and gives the contents a hearty shake to peer inside. Much to my chagrin. So, imagine the jealous rage. The sheer desire. 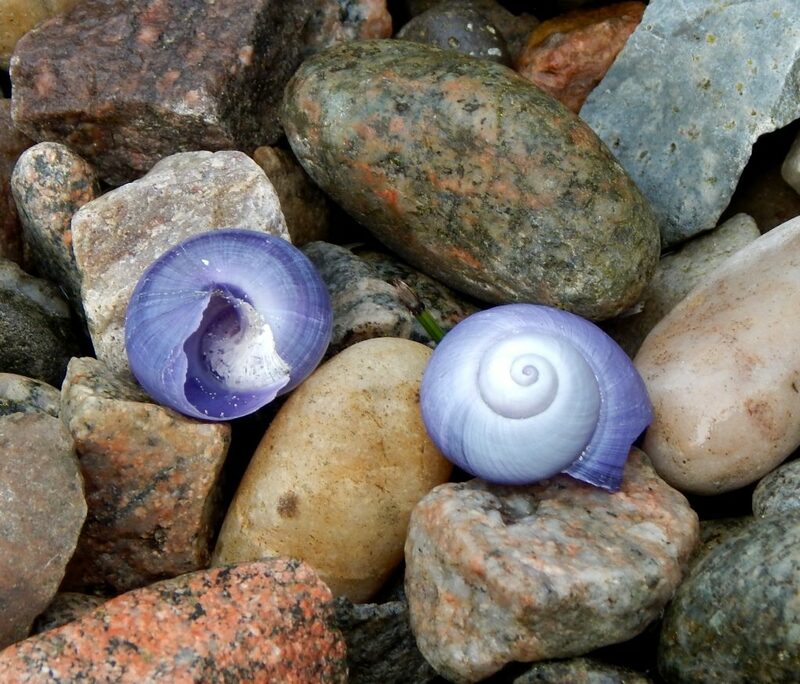 The fit of avaricious longing that resulted from the discovery of a Violet Sea Snail on Tiree. It looks like a bog-standard garden snail. One that just happens to be on mind-altering substances and preparing to attend a Jimi Hendrix concert. Indeed, it’s a sadness that Prince passed away without ever being aware of its existence. It would have been his favourite mollusk, for sure. When the photograph popped up on my computer screen I was thunderstruck. I’m not going to bother pretending that I knew this at the time (and yes, before you ask, John Bowler did; his email pinged back in about three microseconds), but this species usually occurs in warmer waters close to the equator. They live by dangling upside down from a mucous-like bubble filled with air, extending themselves enthusiastically from their shells when the opportunity arises to feed. The snails collect bubbles from the surface to add to their little life raft – which is actually made using chitin. They sort of slime over air pockets, building up their buoyancy aid like a snotty string of balloons. Without this structure, Violet Sea Snails would be doomed to sink to the depths; never to be seen again, like the uneaten hand in Jaws. Scandalously, the snails all start life as males before becoming female later on. – I’ll leave you to draw your own conclusions about their motives for this. But for all its pastel attraction, the violet snail turned out to be a sinister femme fatale. It preys on another very interesting member of our marine fauna: By-the-Wind Sailors. 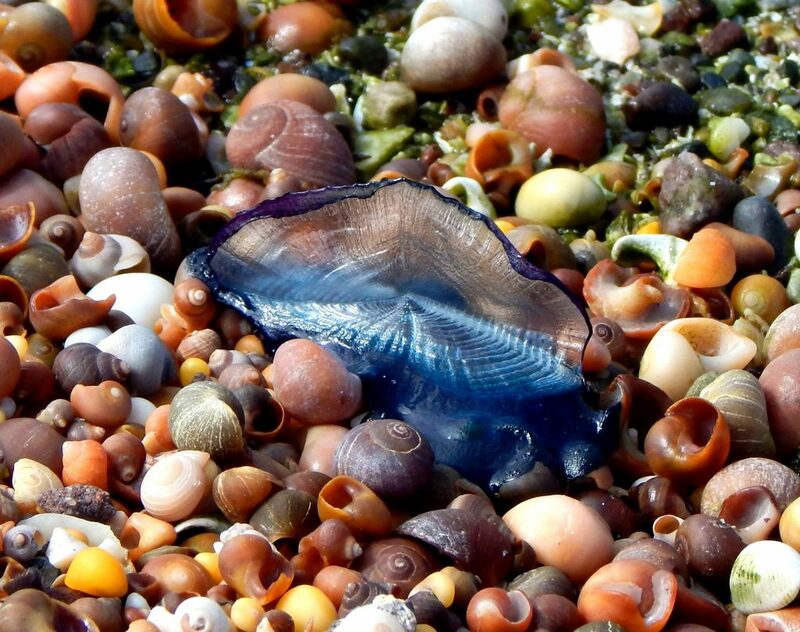 A By-the-Wind Sailor, resting on a colourful bed of Flat Periwinkles. Image Credit: John Bowler. These funky little siphonophores look like jellyfish. However, each specimen is actually a colony of tiny hydrozoans, masquerading as a single organism. For them, the Violent Sea Snail is public enemy number one. Like the sea snails, the sailors aren’t much for swimming; being at the mercy of ocean currents and prevailing winds. They have an inflated ‘sail’ to keep them at the surface and catch the breeze. Unfortunately, this means that both creatures are locked in a low-speed (and presumably very tedious) game of cat and mouse, over which neither has any meaningful control. At the time the first snail arrived, By-the-Wind Sailors were washing up all along our west coast. Once the sailors deflate, dry and lose their ink blue colour, they almost look like plastic litter. 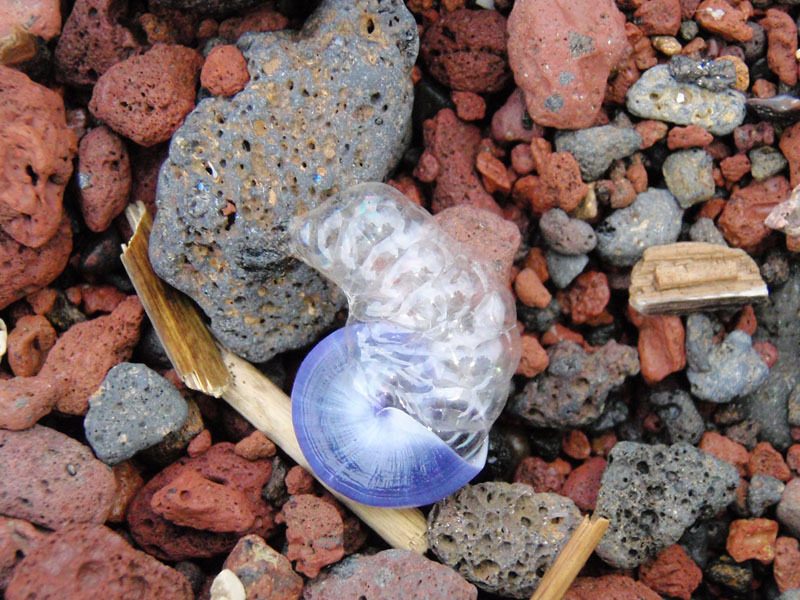 Scouring the strand line and seeing so many of these small transparent discs, I was hopeful. 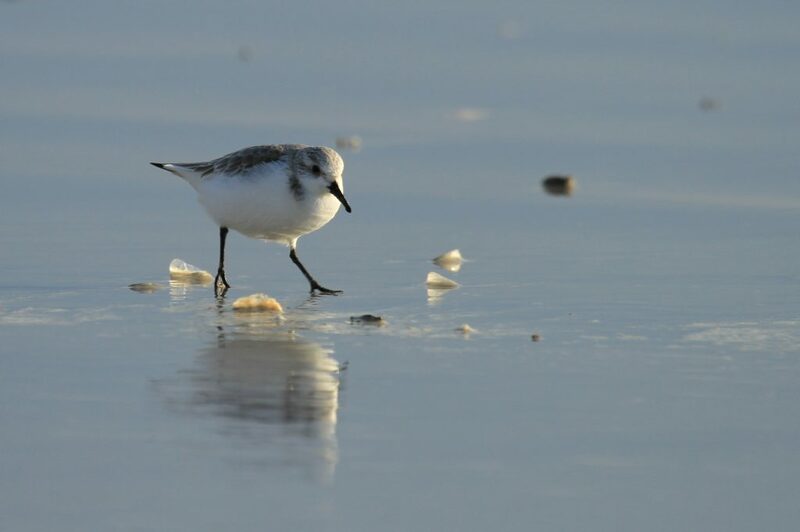 This Sanderling is surrounded by the remains of By-the-Wind Sailors. Once the blue fades, they just look like clear plastic. All over Twitter, pictures were popping up of sea snail discoveries on Tiree. Not just individuals – but handfuls of them. Emails were pinging. People were stopping me on the road. The shell jar was suddenly lacking. In vain, I searched for a mollusk to call my own. I must have cut quite a forlorn figure, trudging along the strand and tossing anything that failed to be a Violet Sea Snail back into the water with disgust. After two days of relentless hunting (with sub-optimal backpack sandwiches to boot) I was tired and I was grumpy. I’d put in the legwork on this one. I really felt that I deserved to find a Violet Sea Snail, and that for reasons unknown, the universe was denying me the joy of this ultimate bounty. I was rather sour faced when I returned to work the next day. It would be whole week before the opportunity to conduct a second expedition came around. Others would be out there – looking – in the meantime. When I met my guided walk guests for the afternoon, it was no surprise to me that many of them had already found a snail. I stood among them. Crestfallen. Snailless. Listening to tales of discovery from beaches that I had visited later in the week and found wanting. It must have come as a shock to my guests when, half way along The Maze beach, their hitherto composed and politely interested ranger shot past like a thoroughbred at Aintree. Nose to the wind and bit between my teeth, I galloped with greedy fingers outstretched towards a small round object on the sand. It had the satisfying heft and plumpness of a Crabapple. Its shell was smartly counter shaded and the most outrageous shade of lilac. Two of the Tiree Violet Sea Snails. You can see the countershading here: paler on the side that sits against the bright sky when viewed from below; darker on the side that sits against dark water when viewed from above. Image Credit: John Bowler. At this juncture, the snail within was quite obviously an ex-snail. Its chitin bubble float drooled unappetizingly over my palm, dripping a dark purple fluid. It didn’t smell iffy – but it was only ever going to be a matter of time. In the end, we found eight specimens that day. There were Violet Sea Snails enough for everyone. John Bowler collated all of the Tiree records, and they were duly submitted to the Conchological Society of Great Britain and Ireland (- who produce a gripping annual newsletter called Mollusc World, if you’re keen). In order to preserve the shell of my snails, each dearly departed resident had to be removed. This was a tricky operation, involving eyebrow tweezers. The snail bodies oozed a rich purple fluid as they came free of their shell. Indeed, this secretion seemed to be the source of the shell colour; it stained my hands like blackberry juice. I wondered if the snails synthesized this pigment from their brightly coloured prey. All things considered, such a macabre undertaking was atoned for by the satisfying ‘plink’ the shells made when they dropped into The Shell Jar. It’s amazing what you can find around Britain’s coast. The carefree pastime of walking along the beach led me to learn about a fascinating animal that I didn’t know existed. That, my friends, is the joy of nature.